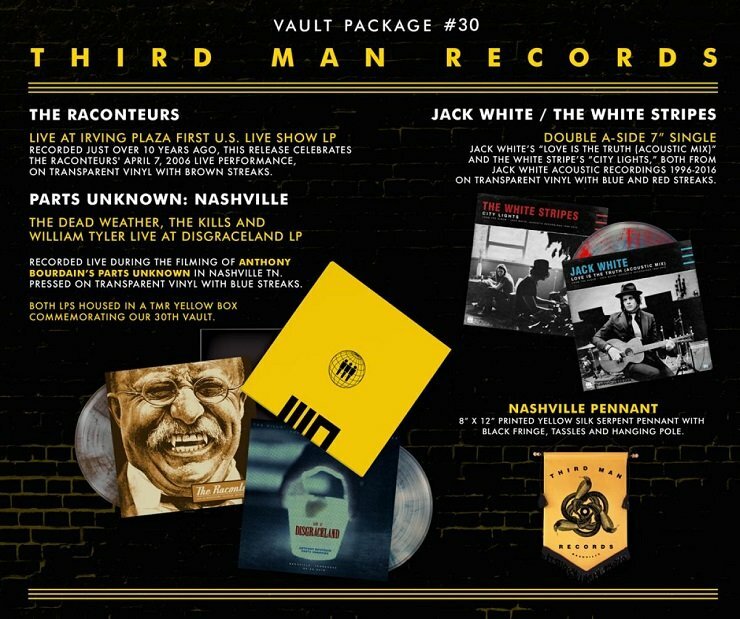 Third Man Records has offered up plenty of Jack White-related material this year, from a pre-White Stripes-geared box set to the songwriter's recent acoustic compendium. Next up, the label salutes the likes of the White Stripes, the Raconteurs and the Dead Weather for the next multi-chambered instalment of the Vault subscription series. A press release from the label notes that the 30th entry into the Vault series will be the last of 2016, and it places various rarities on two separate LP releases and a 7-inch. First up is a full-length concert set from White's Raconteurs project with Brendan Benson. As you may expect by the title of Live at Irving Plaza NYC April 7th 2006, the concert was captured over 10 years ago in New York. This was the band's first U.S. performance and includes early onstage run-throughs of "Steady, As She Goes" and more. The recording is said to be "a solid testament to the early fury and energy of those nascent and exciting times when the Raconteurs were first introduced to the world on the live stage." Live at Disgraceland: From Anthony Bourdain's Parts Unknown is another live-style release, which ties into food and TV guru Anthony Bourdain's recent trip to Nashville. The concert — recorded at an unspecified club location called Disgraceland — featured sets from White's the Dead Weather, as well as the Kills and William Tyler. Each band have three songs on the LP, with a clip of the Dead Weather's "Gasoline" streaming now. UPDATE (10/5, 4 p.m. EDT): Disgraceland is actually the home of Kills/Dead Weather's Alison Mosshart. A double A-side 7-inch of the White Stripes' "City Lights" and the acoustic mix of Jack White's "Love Is the Truth" rounds out the package. Both tracks appeared on the recent Jack White Acoustic Recordings 1998-2016 compilation, but they're being paired here for one time only on blue and red splatter vinyl. As a bonus, the 30th Vault release also adds a Third Man pennant that you could hand proudly in your record room. Pre-orders are being taken until October 31. You can find out all the details over here. The Kills Return with 'Echo Home' EP, Cover Rihanna's "Desperado"